What is “Non-damage Business Interruption” Insurance? You may have seen Non-damage Business Interruption Insurance in the news this month and wondered what is it. With a few carriers now offering this coverage we thought we would ask our in-house expert for the short answer. Q: What is “Non-damage Business interruption” Insurance ? An impact to your business’ income stream can be derived from many different events. Traditionally, insurance has responded to income loss related to physical damage to property that causes an interruption of business. Some coverage does exist for income loss caused by damage to property owned by others that impacts your business. “Contingent Business Interruption” coverage provides protection to a business for loss or damage at a key customer or supplier’s location. In addition, more recently firms are considering purchasing business income insurance that does not require physical damage to owned or dependent property. “Non-damage Business interruption” may protect businesses when covered events cause a disruption of their income stream, even without physical damage. Cyber insurance, for example, has become essential for almost any business that relies upon the internet for revenue. 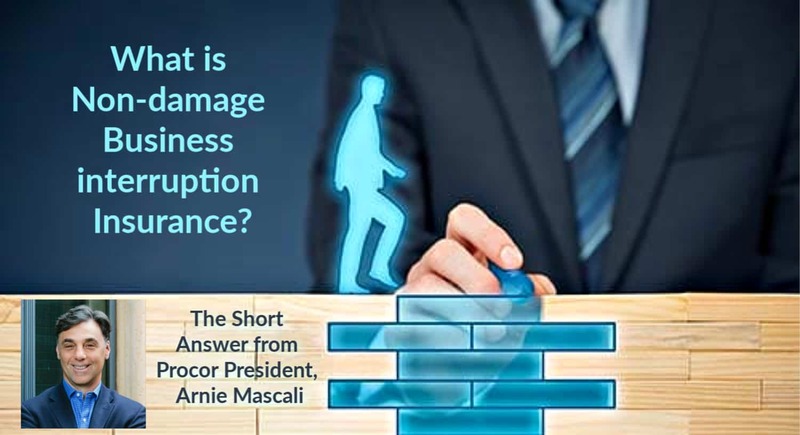 An interruption of that connectivity could be as damaging to the business as a hurricane striking a building. Coverage for other perils is available, and the prudent risk manager should consult with an insurance professional to identify these potential events, and discuss how best to mitigate the interruption of income should the event occur.